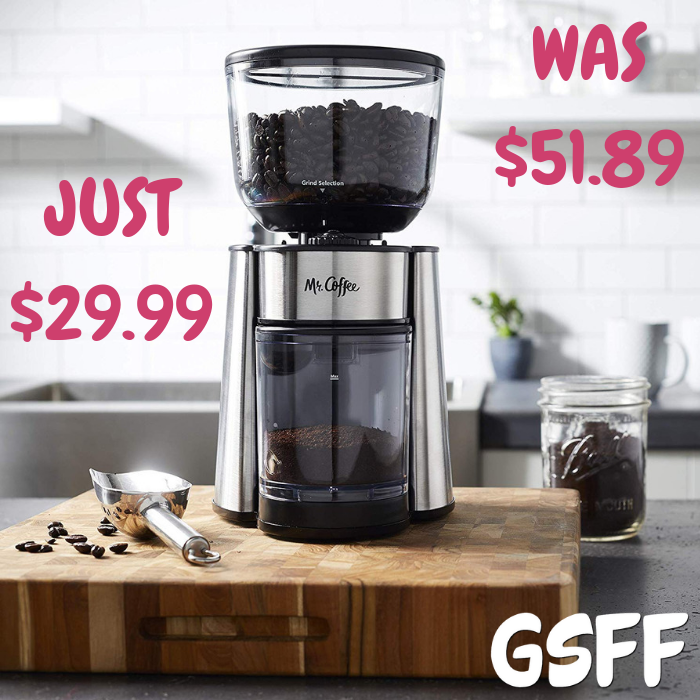 Mr. Coffee Mill Grinder Just $29.99! Down From $52! Shipped! You are here: Home / Great Deals / Amazon Deals / Mr. Coffee Mill Grinder Just $29.99! Down From $52! Shipped! Amazon has this Mr. Coffee Mill Grinder on sale for just $29.99 down from $51.89 PLUS FREE shipping! Burr mills are widely considered to be the best method for grinding whole coffee beans—this is because they are designed with plates rather than blades, thus generating a more uniform grind. And the Mr. Coffee Automatic Burr Mill Coffee Bean and Spice Grinder will help you achieve the richest, most flavorful coffee, time after time. With one simple touch, it grinds beans quickly and easily. No hassle, no mess. It’s great for use with French presses and espresso makers, too!